From the Ponder Couch: Popcorn on the Cob from the Corn Palace! Here's a review I did for my Corn Palace Blog! So the video will go up there as well. As I say in the video it's pretty good! Go out and buy an ear if you have the ability! Here's a picture of the cardboard label thing at the top. Apparently I paid $2.50 for it. It was worth it! Here's what the popped cob looked like up close. And here I am eating it like regular corn on the cob! And here are the instructions inside the cardboard thing on top. And here, finally, is the drawing I made for the stinger at the end of the video to advertise this blog! 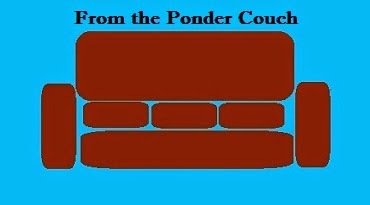 "For more reviews, comics, and other stuff check out pondercouch.com!"